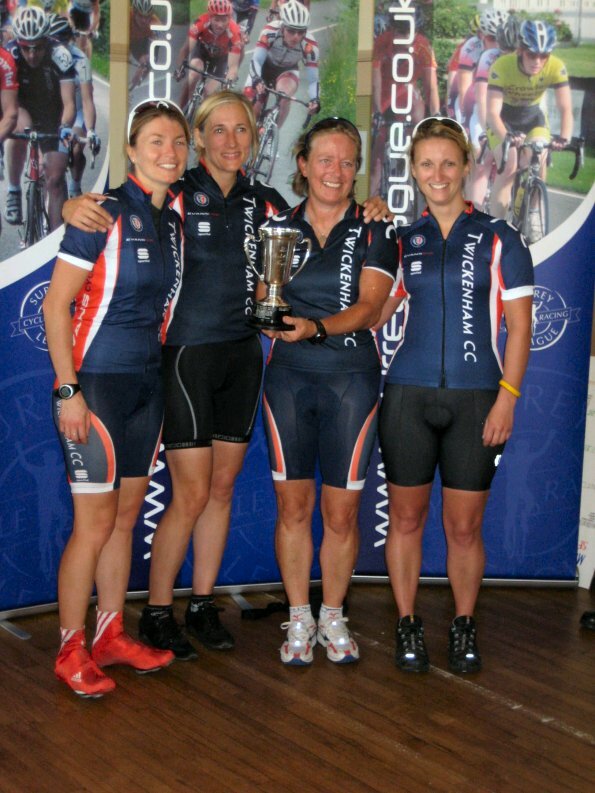 Twickenham Team Time Trial Trophy Triumph! Team B set off in good formation ,and Team A started 9 minutes later, pedalling smoothly, aiming at 30 second changeovers but it’s fair to say that Alex spent longer at the front than us other three. Once the first couple of bumpy miles were out the way we settled into a good rhythm and discovered that shorter, harder stints were more effective than longer ones. It was slightly disheartening to be overtaken by the following men’s team quite early on but encouraging to catch a man from the team in front... poor bloke didn’t stand a chance as we whooshed by! We eased up the hill and into the home straight at the end of the first of two 17.5mile laps on the Alfold/Kirdford circuit, plotting where to sprint from next time round, knowing that only three had to cross the line to count. Into lap 2 and Alex picked up the pace and did longer stints at the front. Our team mantra was ‘strong as an ox!’ and Alex was outstanding! We were all working hard but the thought crossed my mind that the three of us were holding her back, that "Alex the Ox" would have been much quicker if she didn’t have to pull as along... but pull us she did, and the miles seemed to whizz by! Another men’s team whooshed past us and, as they did so, the boys from Sigma whooshed past them – it was getting busy out there! Before we knew it we were into the final 3 miles and Holly was beginning to feel the effects of her Half IronMan the week before – let’s face it, who wouldn’t! She told us to "Go Go Go!" without her, so we did. Hang on a minute... what’s that up ahead? We were catching someone! And it was with a strange mixture of sadness and joy that we recognised the familiar splash of colour of our own Team B! Sorry to say the sadness didn’t last long as we cried "Let’s get them!". We caught up just before the last hill, shouting ‘Choo Choo!’ as we chugged past. This gave us a clear run through to sprint for the line... knowing all three of us counted we tried to keep our formation together and, with "Alex the Ox" still pulling and Tina at the back shouting "Faster Faster! 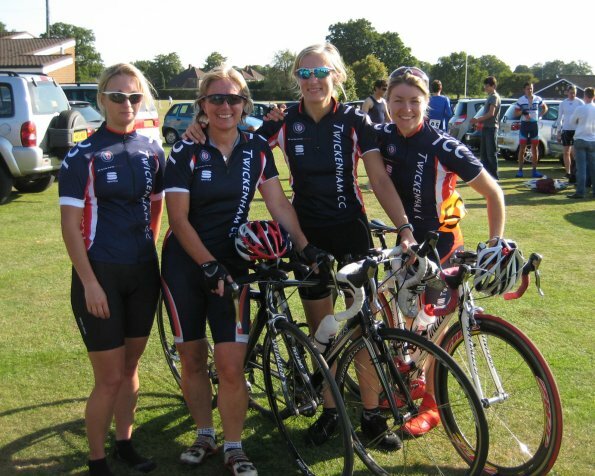 ", we crossed the line in 1hr 37mins, with Holly and Team B finishing a minute or so later. 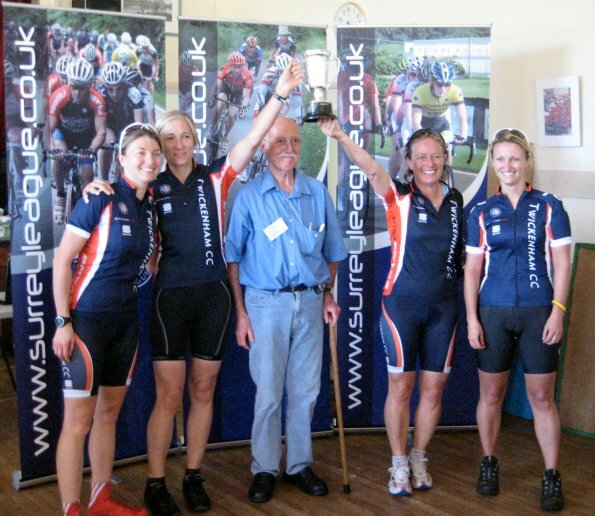 Back at base we were excited to learn we had beaten The Army by four minutes and the other Clarencourt team by six, and were duly presented the Micky Ayliffe Trophy by Mick Ayliffe (his son). Mick was thrilled to have four women’s teams competing, and gave special thanks to Twickenham for entering not just one but two teams. So well done to everybody and also thanks to the invaluable support, advice and encouragement from Stuart and Rob, who turned up on the day to cheer us on! It was a lovely day, well organised and marshalled, and we all learned so much! AND we even managed to avoid Guildford one-way system on the way back too!